224,660 page views over twelve months, updated daily. Bradford Council are celebrating the centenary of Representation of the People Act on the anniversary of the landmark 1908 suffragette rally that took place on Shipley Glen - 'Hats Off Forward Together' on Monday 28th May 11.30am-4pm. A fun, family event we anticipate over a thousand people will march from Roberts Park to Shipley Glen via the Cable Tramway and join in a celebration on the Glen with stalls, street entertainment, speeches and stage performances. We invite you to be part of this event - with a stall and/or a speaker from your organisation on our event stage. If you or your organisation is concerned with issues related to gender equality or women's rights, historically or currently, and you would like the opportunity to speak briefly on our stage, please contact Jenny Wilson, who is the Creative Producer for the event by emailing jenny@irregulararts.com by Tuesday 8th May. If you are interested in having a stall at this event, please contact Karen Lewis for details. You can bring relevant information stalls, stalls selling craft items and wares or food/cakes (subject to your own insurances). We cannot guarantee all applicants a stall on the day, but please submit details of what you would like to bring by emailing Karen no later than Tuesday 8th May karen.lewis@bradford.gov.uk. Senior Social Group in Baildon, meeting at Baildon Community Link, 35 Cliffe Avenue on the 1st and 3rd Wednesday of the month, 10-11:30am. 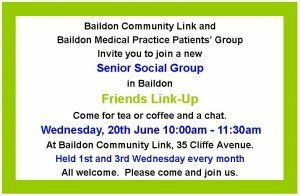 Organised by Baildon Community Link and Baildon Medical Practice Patients' Group. An interracial family struggles to adjust when they move from New York City to a small, predominately white town in Washington State. Denso Marsden Nature Reserve Family Fun Day. 1-4pm. Entrance to the reserve via the Public Footpath, opposite St. James' Church, Otley Road. Our second Saturday walk . An 8 mile moderate walk, led by Paul Robinson which will take you out of Baildon via river bank and canal into Buck Woods. Lunch at farmyard tea room and back via The Woolpack at Esholt. Light refreshments will be served from 7.15p.m. Nearly-New Stall: walking clothing, books, maps. Please "Bring" any items you no longer use, and "Buy" to help our funds. 3. Approval of minutes of the last AGM. 4. Chair's report on achievements in past year. 5. Current focus: come and find out our future activities and plans. 7. Election of committee for coming year. (if you would be interested to stand for election to the committee, we should love to hear from you). A Panel of local "experts " on countryside, walking, and rights of ways issues, will provide information and answer your questions. Do come along and bring your friends. Please note that there is a small car park at the church (off Westgate) and some limited on-street parking nearby. The best bet is to park at the Ian Clough Car Park in the centre of Baildon - just 5 minutes walk away from Wesleys. Live bands, bouncy castle, face painting, tombola, storytime, lots of stall, bbq and cakes, bring your own picnic! Event at Kirkgate Centre in Shipley as part of the Campaign to establish a Shipley Town Council. Music from Plumhall and local bluesman Gerry Cooper. Fun quiz , raffle and opportunity to sign the petition. £5 on the door. 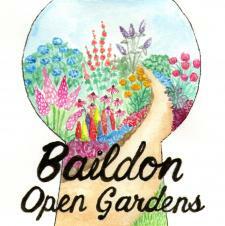 Baildon Open Gardens is back again for its third year, so get the date in your diary! As usual, we'll have lots of diverse and interesting private gardens open for you to visit, as well as refreshments, plant sales and activities for children. The event raises funds for local charity, HALE, and we welcome anyone who would like to get involved to help make this year even better than last! Entry is £4 per person, with children under 16 free. HTML5 validated. WCAG compliant. Page generated in 0.11 seconds.